Over time, the physical structure of a building can become like a memory bank. The data stored is an accumulated history of not just architecture, but the wear-and-tear of past usage, the tastes and styles of times it passed through, and events from triumphs to disasters. What if this montage of stories becomes the language of a new architecture to bring a building back to life? 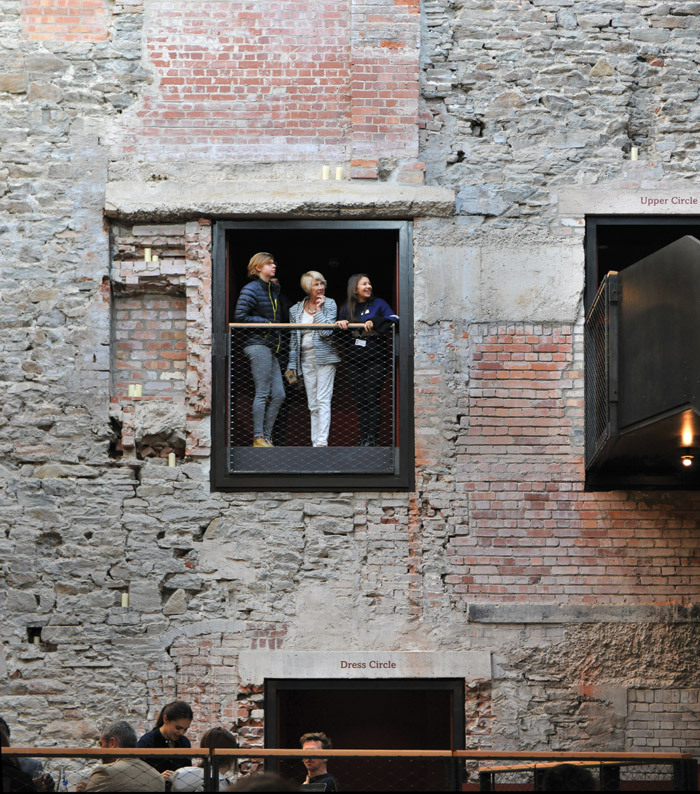 This is what Haworth Tompkins has brought to two venues that recently reopened. 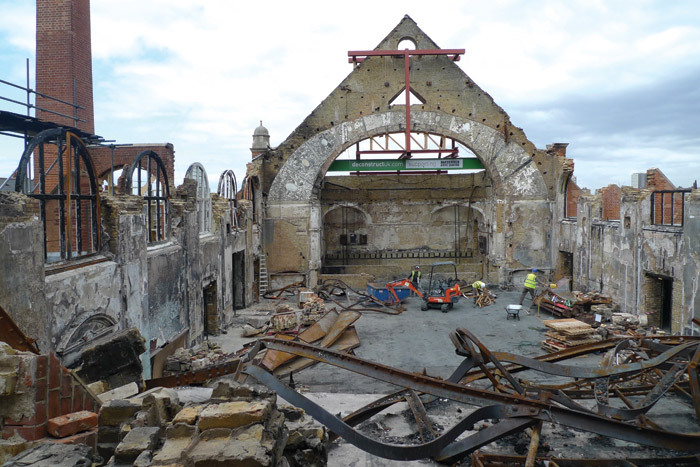 One is The Bristol Old Vic, England’s oldest theatre, the other is one of London’s greatest auditoria, the Grand Hall of Battersea Arts Centre, decimated by fire in 2015. 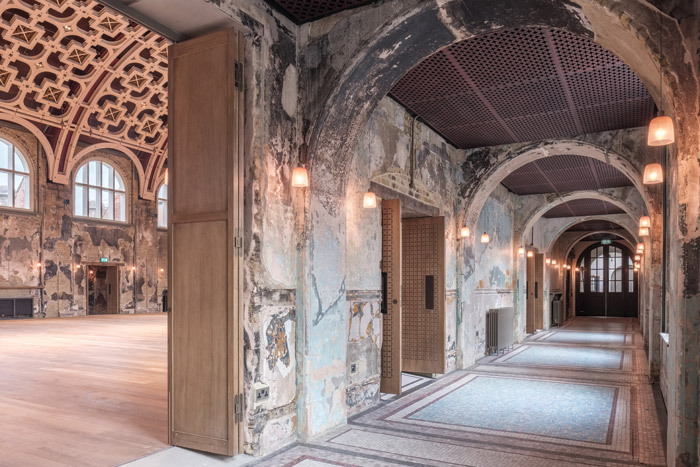 In both cases, the venues’ reanimation is palpably charged by the treatment of their physically embedded past, and new features that recast their history. 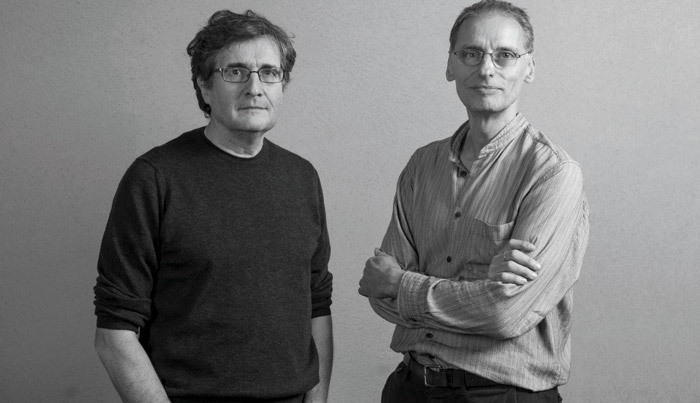 The practice was set up by Graham Haworth and Steve Tompkins in 1991 and has established a distinctive, award winning presence in the UK from masterplanning to a portfolio of projects in the academic and residential sectors. 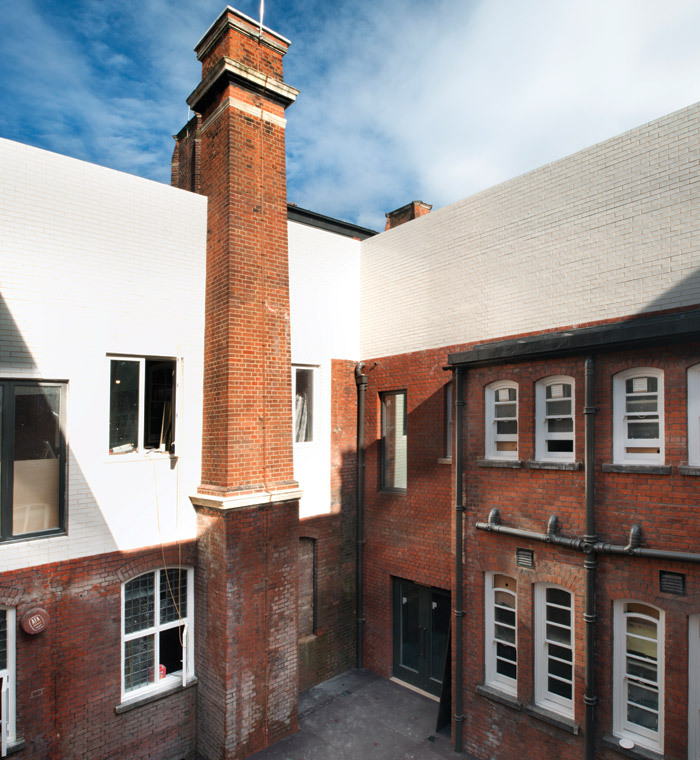 These old theatres are very different beasts to the practice’s other contemporary projects such as, for example, the recent Silchester Housing in North Kensington, a 2018 Brick Award winner in which artist Nathan Coley was asked to mark the site’s radical history of Frestonia which declared independence from the UK in 1977, or the under construction high-density canalside residential blocks of Fish Island Village in London’s Lea Valley, where Haworth Tompkins is working with Peabody Trust and Hills Residential (‘We like working with organisations with a social agenda,’ comments Haworth). There, the 7m-high, groundfloor, adaptable studios to tempt the fashion industry have driven the practice’s research into what it calls ‘use-less space’, meaning not useless but designed as function agnostic space. 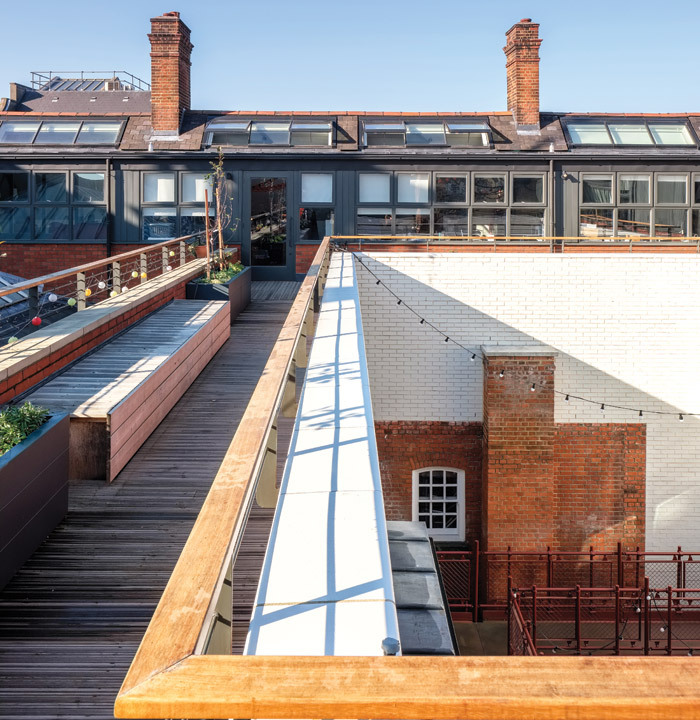 Haworth Tompkins’ involvement with cultural venues took off in 2000 with the reinvention of the Royal Court Theatre, London (Blueprint 170), a breakthrough project for the practice. 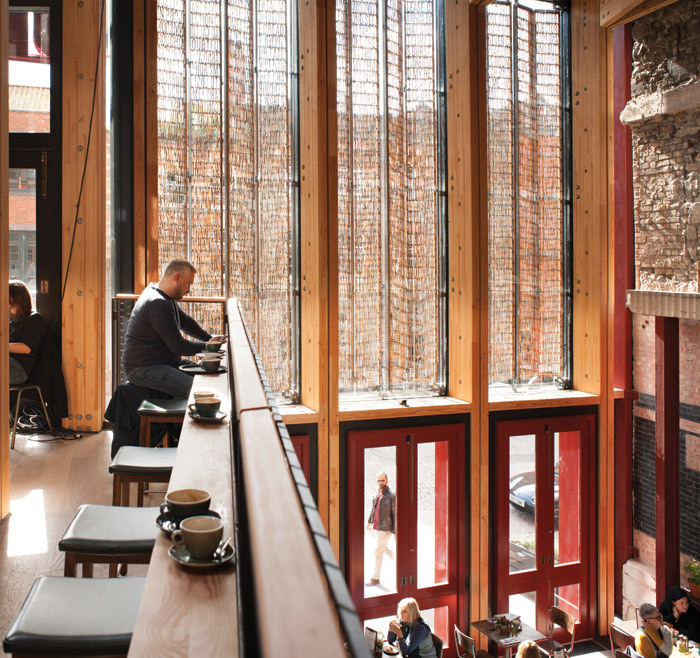 A stream of cultural venues has followed which includes the Stirling Prize-winning rebuilt Everyman Theatre, Liverpool. These, added to the Battersea and Bristol projects, led to Steve Tompkins being named this January as the most influential person in British theatre, as per The Stage 100 list. ‘We will look back on [Tompkins’] achievements in reimagining theatre buildings, their functions and forms, as a defining aspect of early-21stcentury British theatre,’ says The Stage editor Alistair Smith. 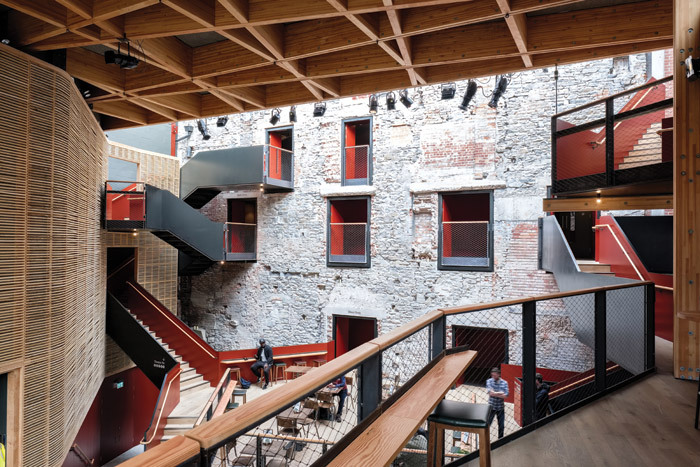 The Royal Court Theatre project also reset how we think about renewing listed buildings, opening them up and exploiting the old fabric as a frame for renewal. That’s something that Haworth Tompkins applies across typologies, as for example at Kingston School of Art’s Knights Park campus, where the renewal of a chunky 1970s building is in progress within the robust shell of brick, concrete and steel — as Haworth says, it reiterates the idea of ‘the chassis of a building that can change use over time’. At Bristol and Battersea, the buildings remain in theatrical use, but the total experience offered by the theatres has changed. You tend to see red when you encounter a Haworth Tompkins venue — the drum of The Royal Court’s auditorium is vermilion, and the exterior of the National Theatre’s temporary iconic all-timber The Shed (2013) was entirely bright red. ‘We keep coming back to the combination of a deep maroon base and this bright red colour — they seem to get the party going,’ Tompkins muses. 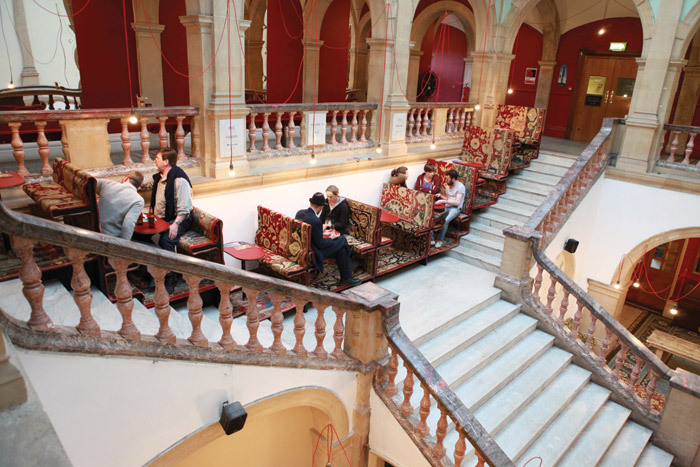 Initially, in 2006, Haworth Tompkins created temporary interventions in under-utilised space in the Town Hall in preparation for the 2007 Punchdrunk performance of The Mask of the Red Death (which ultimately brought 46,000 people to BAC). During the interventions, the practice adopted the ‘scratch’ working methodology developed under Jubb — an experimental approach to performance of trying something small out first to see if it works. Applied to the building, the result was a series of low-cost works that left surfaces stripped back, creating what Haworth Tompkins associate architect Martin Lydon calls ‘a provisional architectural language revealing historic fabric’. 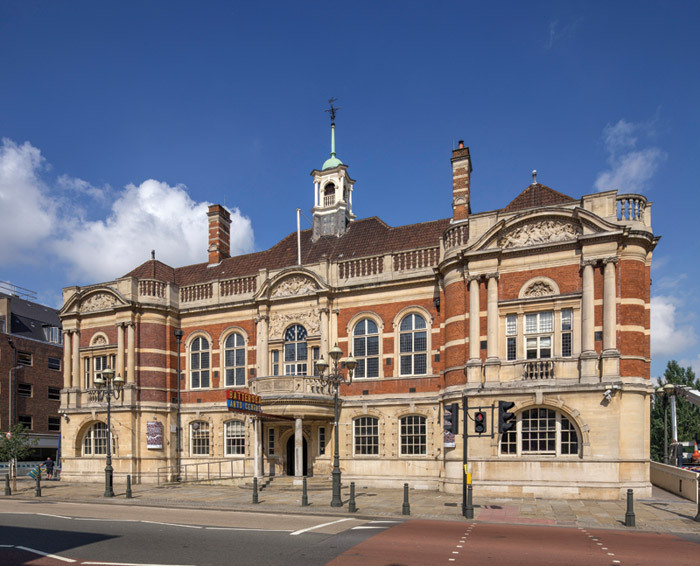 In 2009, the practice undertook refurbishment works on the Grand Hall and in 2014, a new phase commenced — capital works that changed the Town Hall structure itself. 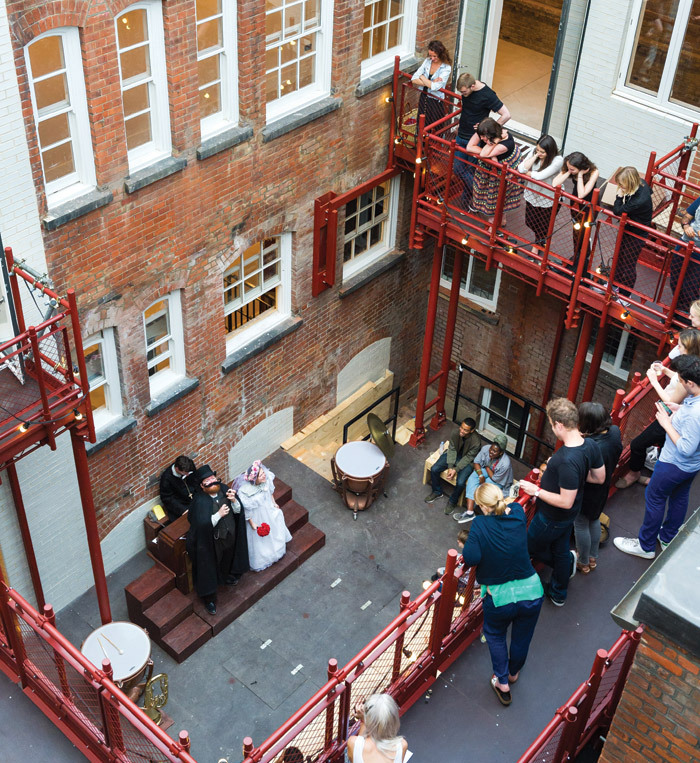 The courtyard was cleared, deepened by new build, lined with white brick and demountable red steel gallery walkways were installed, creating yet another performance space, this one with a ‘bearpit’ feel. Offices were relocated to the refashioned attic space above. Internal space expanded by a tenth. As all this was underway, disaster struck the Grand Hall — in March 2015, fire completely gutted it, leaving the pitch-roofed volume’s gable walls at either end ‘swaying in the wind’, as Lydon says. The rest of the centre, luckily, was left unscathed. So in 2017, Haworth Tompkins started an £11m reconstruction project on the Grand Hall, which consequently reopened in summer 2018. The auditorium is large, with a standing capacity of 1000, or, with demountable seating, up to 500. While the size itself invokes awe, it is the new barrel ceiling that has the wow factor. The old ceiling had lousy acoustics but was an elegant field of repeated decorative motifs. The new ceiling consists of three layers of poplar birch plywood cut to the same geometric pattern of squares within oblongs, mounted on a steel frame. It is stunning, as delicate as if cut from paper, its layers giving it an intricate sense of depth, yet it’s solid and stretches 25m and spans 18m. Its permeability lets air flow through, into the rebuilt lantern cupola above which is now a natural ventilation outlet. Acoustics are enhanced and adaptable to the type of performance by drapes which can be rolled out from boxes in the space between the barrel ceiling and the pitched roof, which hosts hoists on rails and technical walkways. As in the Town Hall, the walls reveal their record of the past in brick and plasterwork. In the side corridors, the damage of fire brigade water flooding leaves its trace in beautiful patinas, hauntingly lit by the glow of lights with soft silicone shades, a collaborative design by Haworth Tompkins and designer Rob McIntyre. However, ghosts of the past seem banished from the Scratch Hub, a new, overlit co-working suite, on the floor below them. Another new intervention is in the side street that descends beside the Town Hall. 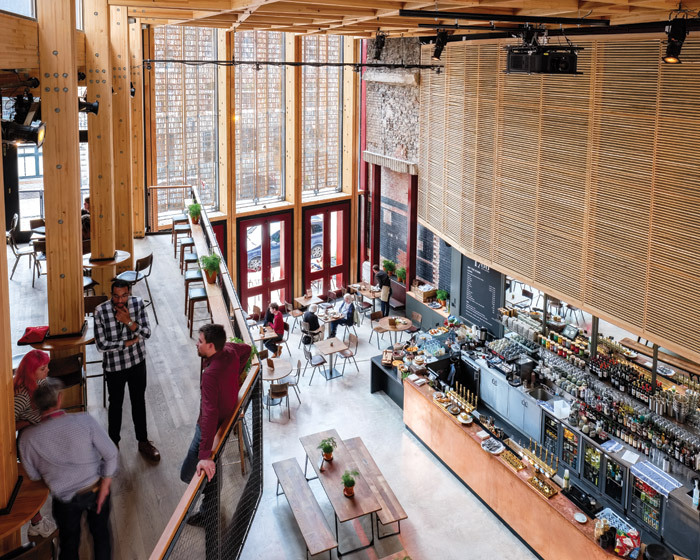 The venue’s name is proclaimed with big letters in a bespoke font by Jake Tilson, cut like stencil into a steel beam balustrade in that oxide red, mounted on a new ramped entrance to BAC’s bar. 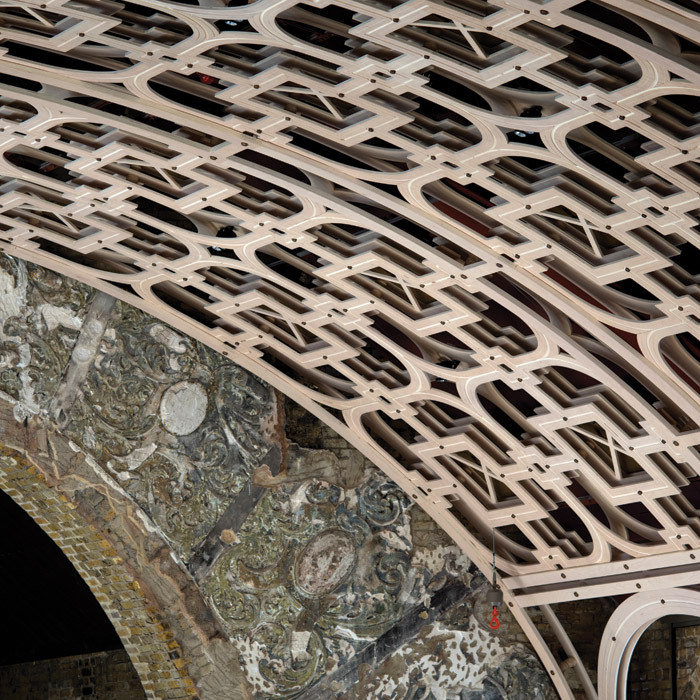 Haworth Tompkins’ collaboration with BAC now spans 12 years, but it’s not yet over. Mountford’s sublime Grand Hall entrance, with its octagonal skylight, is accessed from this easy-to-miss side street. The practice will next transform it into shared pedestrian space with plantings, with an anticipated completion of summer 2019. 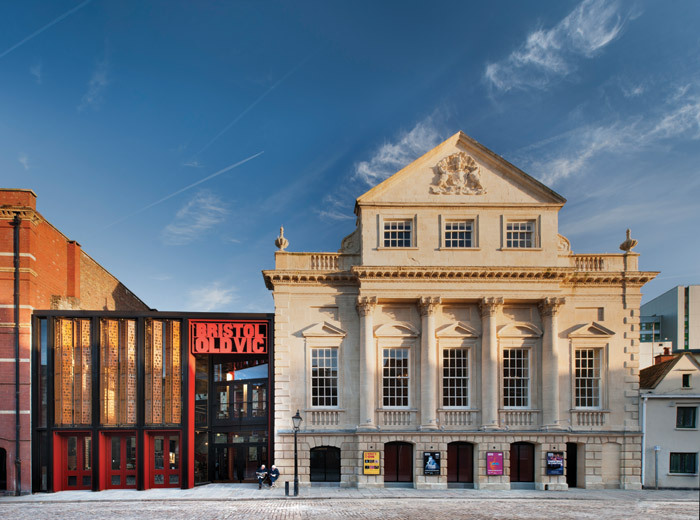 The oldest active English-language theatre in the world is Bristol’s Old Vic, which opened in 1766. Haworth Tompkins’ £15m project, begun in 2009, doesn’t cover the auditorium (designed by a carpenter called Saunderson), but rather the site between it and King Street to the south. This is occupied by Coopers’ Hall (1744) with its imposing neo-Palladian facade designed by William Halfpenny. The theatre was accessed via an alley — at first, surreptitiously, because it operated illegally until 1778. Like the theatre, Coopers’ Hall is Grade I listed, and in the Old Vic’s 1970–72 refurbishment by Peter Moro (a Lubetkin protegé whose portfolio included the Nottingham Playhouse, 1963), it hosted the doubleheight entrance with stairs. Moro designed a new concreteframed volume to house the Old Vic’s Studio Theatre, where the houses had been. Despite Moro’s views on the ‘banality of functionalism’, the brief resulted in a blind brick wall facing King Street. 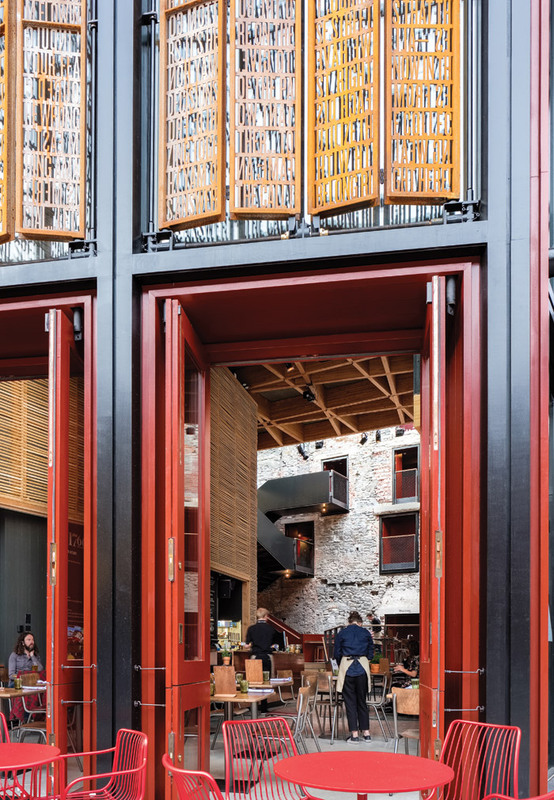 Haworth Tompkins’ big idea was to open the theatre to the street and the city, and that meant Moro’s volume had to go. That liberated a space some 10m wide on King Street, and reaching some 25m deep, right back to the 1766 theatre wall. This space is now the new foyer, a double-height enclosed void mostly under a sedum roof. The complete transformation of the Old Vic experience from its reopening in September 2018 starts with the new glazed permeable facade, which Haworth Tompkins associate architect Tom Gibson calls ‘a filter’ between the theatre and the city. The theatre’s name is in bright red letters (backlit with red light at night), and mounted next to it are vertical shutters which act as bris-soleils, made of waterjet-cut corten steel to carry the words spoken by David Garrick at the theatre’s opening in 1766, and those of contemporary Bristol poet Miles Chambers. Immediately behind the facade on one side is an exposed concrete ledge outcrop in the wall — a relic of Moro’s building supported on steel columns, its wavy edge from cutting work left exposed. The western side of the foyer continues with a spread of thorn oak lath slats which conceal air in-take chimneys and reference those found in the old theatre’s roof. The foyer’s own ceiling is a sturdy timber lattice. It adjoins a full-width skylight at the far end, bounded by the old theatre’s external wall. This is now an internal wall, an architectural switch which recalls one wall of the Whitworth Gallery’s Sculpture Court (1995) by Ahrends, Burton and Koralek. The Old Vic wall is not only left far rougher, it stores layers of history — patches set in the 250-year-old brick reveal 1880s alterations in red brick, and Moro’s works left concrete lintels, yellow brick and almost Juliette balcony-like openings into his foyer around the old theatre. Haworth Tompkins has perched wax candles on the wall, which are actually electric and remotely controlled. On either side of the wall are new timber stairs with black balustrades, and to the east, where the site extends sideways behind Coopers’ Hall, is a new lift core for universal access. It exposes its rough concrete setting edges — ‘we decided to leave it as a found texture,’ comments Gibson. The foyer floor is all tables and chairs, including some at the back for restaurant customers which are on a dais podium behind demountable balustrade barriers so it can actually become a stage. The east side of the foyer hosts the box office, beneath a wide gallery terrace overlooking the foyer, and behind them is Coopers’ Hall. Haworth Tompkins has restored (without any rough, raw touches) its grand first-floor room by rebuilding the floor lost to the previous entrance configuration, so it can now be used for events. Below it they have created a new Studio Theatre, seating some 100 people around a thrust stage area that is sunk to basement level. There’s a strong progressive streak running through the theatrical venues that Haworth Tompkins have worked with, which if not overtly political, is at least implicit in their programme. The Royal Court champions new provocative writers, the Everyman Liverpool was an original ‘angry young man’s theatre’, and Battersea has rallied peoplepower in both its history and its cultural agenda. All this chimes well with Haworth Tompkins’ sense of social agenda. But how does a traditional theatre like Bristol Old Vic fit in? The city of Bristol is only now coming clean about its slaving history. Tompkins says that one of the chief project aims was about ‘changing its identity from an edifice built on the proceeds of slavery to an inclusive gathering place for the whole of Bristol’s community’. At Battersea and Bristol, Haworth Tompkins has brought leaps of imagination to reinventing challenging sites. Reusing found remnants can echo the grandeur of Chipperfield’s similar approach to Berlin’s Neues Museum (2009), yet also create eclectic tableaux on an intimate scale. Tompkins compares the latter to Kurt Schwitters’ 1930s ‘Merzbau assemblage of materials and textures that rely on an overall, conglomerate coherence for their effect’. Overall, the past becomes a portal to the future. Not least, Haworth Tompkins has created dynamic, inclusive space. A red neon sign above the Old Vic’s new door offers the suggestion to ‘Come on in’, but the architecture of these venues issues a veritable demand to local community to participate in the culture and possibilities within. That’s a pretty radical result.